There has been a place of Christian worship in Melverley for about a 1000 years. In late Saxon times, there was a small hermitage in Melverley on the river bank by the ancient trackway near the crossing of the Rivers Severn and Vyrnwy. At this time, the ancient Manor of Melverley was held by a family headed by Ealric. After the Norman Conquest the Manor passed into the hands of Rainault, who was deputy to Roger de Montgomery the first earl of Shrewsbury and a kinsman of William the Conqueror. 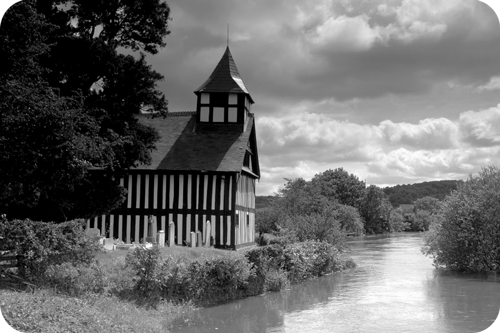 In 1141 Ordericus Vitalis mentions a “wooden chapel on the banks of the river above Shrewsbury”. There seems little doubt that this was Melverley Church. In 1401 this church was burnt by the Welsh chieftain Owain Glyndwr and rebuilt in 1406. The Manor passed from the Earls of Shrewsbury to the Fitz-Alan family who resided at Oswestry Castle. They became Earls of Arundel through marriage, and retained the Manor of Melverley until 1566, when it passed to Thomas Younge, Archbishop of York. Nothing is known about the holder of the Manor subsequent to this date, but the scattered community of Melverley has continued to work on the land beside the River Vyrnwy to this day. Those who live and work in Melverley today look back with pride to a history of over 1000 years and still worship regularly in the church founded so long ago. The church as it now stands was built and in use by 1406, only five years after the burning of the old church by Owain Glyndwr. This was a remarkable achievement. Work must have started immediately after the fire. With the exception of the lower two-thirds of the east wall behind the altar, the structure you see today is substantially as it was built. 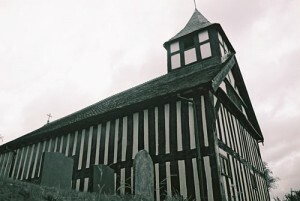 Melverley is a rare example of early British churches constructed of timber, wattle and daub. Notice the white sections are narrower than the timbers. This is a sign of an early timber construction. The entire structure is pegged together throughout, not one nail being used. The timber is local Melverley oak. 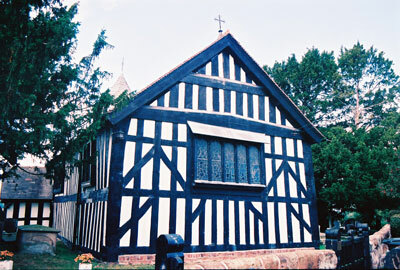 The church is entered through a porch and small vestibule, the latter being created by the erection of a wooden screen in 1588. As you enter the church the central focal point is the altar. The altar is the communion table where the Christian congregation gather for Holy Communion, the Christian family meal. In Melverley the altar is an early Jacobean one, around which the people of Melverley gathered to celebrate the Holy Communion nearly 400 years ago, and continue to do so today. The pulpit is also Jacobean, with interesting carving worthy of close inspection. The lectern holds a chain Bible dating from 1727. Bibles were chained in those days because, as reading became more universal, there was a danger the Bible might be borrowed and not returned. The font is almost certainly Saxon, a survival from the original pre-1401 church. Baptisms have been taking place at this font for 1000 years. The font cover dates from 1718. The pews date from the early 1700s, but with some copies added later. A narrow turning staircase is used to reach the gallery. The gallery is sloping, but this is not due to subsidence. Rather it is the result of the way in which the massive piece of oak, on which the gallery is built, settled when originally put in place. Two yew trees in the churchyard are estimated to be between 380 and 450 years old, so were planted many years after the church was built. A third yew has been planted in the new churchyard as part of the Millennium Commemorations. This is a cutting from the Old Enton Yews in Surrey, which are estimated to be 2000 years old. 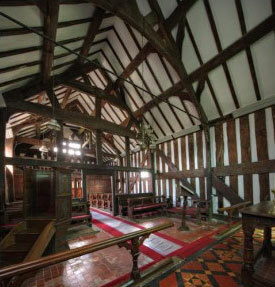 1588: The panelling inside the door and gallery were added. 1878: The plaster was taken down and the east wall rebuilt. An altar and choir stall were added. During this work a carved piece of wood was found beside one of the pieces of timber forming part of the framework of the building. It was within the wattle work and it seemed that it had been hidden there. It is about one foot long with a disc at each end. One disc is flat and plain, about two and a half inches in diameter. The other is smaller, one inch in diameter, and is roughly carved on both sides with a cross. It has been suggested that it is a 17th century scholastic ferule used to strike pupils on the hand for bad behaviour. Was it hidden during the restoration of 1718 in the wall of the church? Who hid it and why? We will probably never know. 1925: The glass in the east window was added and major structural repairs were done. 1990-1992: The river bank was found to be unsafe under the church. A 100 foot long steel wall 30 foot deep was inserted into the ground between the church and the river. Major repairs were done to the west and south walls and the Victorian altar and choir stalls were removed. 2000: To commemorate the Millennium, a sundial for the churchyard was made by local craftsmen, and a service of dedication was held on New Year’s Day. This followed the ringing of the church bell 2000 times by parishioners. 2002: A new golden-leaved hedge has been planted as the boundary of the new churchyard. This is the Church’s contribution towards the celebrations of the Queen’s Golden Jubilee.